I posted this recipe several months ago as I sat on my screened in porch and overlooked my now seeming enormous backyard. Today, on a lovely Wednesday of Spring Break, my friend and I sit on my front stoop and enjoy this same dish, with just a little different view....still tastes AMAZING! There is nothing more to say about this except that it is delicious! This is my all time favorite breakfast...in fact if it is on the menu I can't bring myself to order anything else! I finally had the courage to try it at home and it was incredible!! On a cookie sheet lay out the English muffin halves and Canadian bacon. Place under the broiler until the muffins are light brown. Make sure not to dry out the bacon. Fill a poaching pan up to the fill line on the cups. Pour in a teaspoon of vinegar and bring water to a simmer. Add eggs, one at a time, to each cup. Cook 3-5 minutes depending on preference (I did 5 minutes and it was perfect). 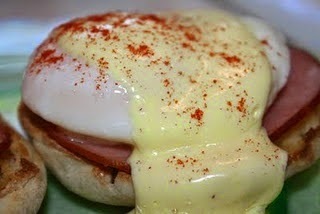 Remove egg from individual cup and layer the Canadian bacon, poached egg and hollandaise on top of the English muffin. Sprinkle paprika on top of each.